Please view the original blog post for subsequent updates by Daniel Pipes and reader comments. 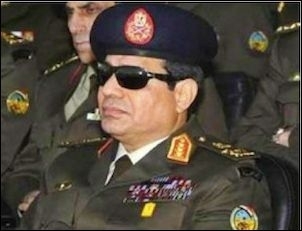 An Egyptian court in short order sentenced some 529 people to death today for the killing of a single police officer. News like this gives one pause. Very tough treatment of Islamists is needed to repress this totalitarian movement, including rejection of their efforts to apply Islamic law, keeping them out of mainstream institutions, even excluding their parties from the democratic process. But Field Marshall Abdel Fattah al-Sisi's extra-legal crackdown on Islamists will likely backfire and help the Islamist cause by winning them broad sympathy. Even if today's absurd judgment gets reversed on appeal, it and others like it are doing real damage. Sisi is riding high now, with out-of-sight popularity ratings, but he appears as unprepared to rule Egypt as another military man, Gamal Abdul Nasser, was 60 years ago. Two factors in particular – the dismal economy and the hostility between pro- and anti-Islamists – will likely bring Sisi down fast and hard. When that happens, Islamists will benefit from his incompetence no less than Sisi exploited the failures of Mohamed Morsi. The cycle continues, the country falls further behind, and the precipice looms. More broadly, because the expected Egyptian failure in suppressing Islamism will have global ramifications, Sisi's mistakes damage the anti-Islamist cause not just in his own country but internationally. The stakes in Egypt these days are high indeed. Related Topics: Egypt, Radical Islam | Daniel Pipes receive the latest by email: subscribe to the free mef mailing list This text may be reposted or forwarded so long as it is presented as an integral whole with complete and accurate information provided about its author, date, place of publication, and original URL.